Occupying 70 linear metres of direct beachfront, this is the largest villa in the alluring residential resort of Punta Esmeralda. It is built in a Mexican Pacific style with hacienda-like elements inside while being wrapped by ocean and manicured jungle on the outside. 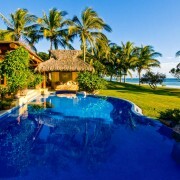 Private and in a prestigious development but not at all isolated, it’s a short beach walk to either Bucerias or La Cruz, both being typical pueblos with plenty of services and diversion. 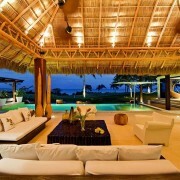 The home is built on two levels with the principal lounging and dining areas being at the ocean and garden level. Here the focal point is its infinity pool and over 1,000 square feet of patios with outdoor kitchen and dining areas, all spanning the margin between ocean and interiors. A wall of windows opens to unite the patio and living and dining room seamlessly. The majority of the guest quarters are concentrated on the upper level for maximum privacy and prime views. 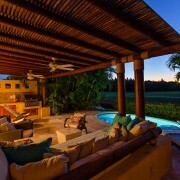 Its physical and landscape architecture are the creation of the Casas de Mexico architectural team while the casually elegant interior appointments are the work of interior designer Ana Vergara.